I have a card for you today using a new set of stamp from Happy Little Stamper-Wish you were here. This isn't a Christmas set but I decided to make it one! I thought I was going to give this challenge a miss but then deicded to have a look at all the books I had read recently. Then a light bulb moment hit me when I saw a book that my blogging friend Shauna recommended to me. It is called the 'Paris Architect' by Charles Belfoure. It is one of those books you can not put down. If you want to see find out more about this book, just click here. I hunted to find a sketch I could use and went with the latest at Freshly Made Sketches-flipping it and using score lines for the horizontal line and my snowflake stamp as the circle. 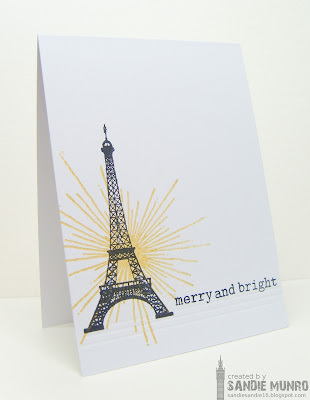 Here my snowflake stamp is illuminating the Eiffel Tower......I can't believe how many ways this stamp can be used! Fabulous Sandie. Love the touch of scoring to ground the image. Will have to check out the book. LOVE LOVE LOVE this. The stamps are great too. Must ask you about your experience of buying internationally as I always worry about custom charges. Love your style, always CAS and elegant too! Off to take a look at the link about the book. What a creative take on the challenge...so cool. Thanks for sharing at Less is More! What a great card! Love that Eiffel tower and the sunburst behind it! So pretty! Thanks for joining us this week at Freshly Made Sketches! Love how you flipped the sketch! Beautiful card! SUPER CAS design hon! I love the combination of stamps you used and the scored lines are just perfect for one layer CASilisciousness. I see some challenge wins coming up with this card! Well done! Ohhhhh, this is so beautiful! Such a striking design, Sandie, and you've showcased Kylie's new stamp brilliantly here! Love your use of that snowflake, fabulous idea. Beautiful CAS card..Love the star behind the Eiffel Tower..
Love this card. Fantastic to have the sunburst and eiffel tower together. I also read The Paris Architect and would highly recommend it.